John C. Sayer, right, thanked paramedics Taryn Overhill, left, and Warren Kniepkamp, centre, for saving his life on March 30. He suffered life-threatening injuries while riding his Harley Davidson east on Williams Road, and was struck head-on by an SUV that had crossed the centre line. 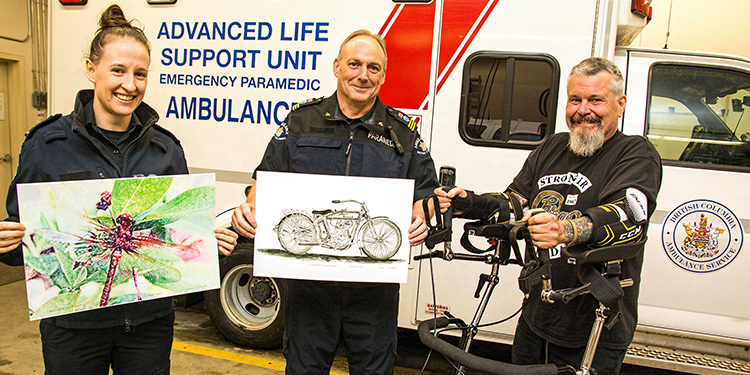 Richmond artist John C. Sayer was discharged from Vancouver’s Holy Family Hospital on Nov. 21, and almost immediately began planning how to thank the emergency responders who saved his life. It was nearly eight months earlier, on a sunny Friday afternoon on March 30, while Sayer was on his 2008 Harley Davidson Electra Glide motorcycle, that he came within a brushstroke of certain death. As he was heading east on Williams Road, toward No. 2 Road, an oncoming Ford Escape SUV crossed the centre line, and struck Sayer head-on. The next thing he knew it, he was laying on the road, his hand facing the opposite direction it should have been, his leg torn off, and a bone sticking out of the left sleeve of his jacket. Sayer sustained 38 upper body fractures, and lost his left leg above his knee. But by some miracle on that Good Friday afternoon, his head, neck and back were spared. Sayer’s head missed the hood of the SUV by just a couple of inches. Sayer was reluctant to talk about the crash, but instead wanted to focus on the people who saved him. Since they gave him his life back, Sayer thought it would be appropriate to give them a piece of him, in the form of his artwork. “Instead of a card or flowers, I wanted to give them something I created. it’s the most personal gift you can give,” Sayer said. Sayer said he’s long had a healthy respect for emergency responders. When he was 16, a police officer got him his first job. And in recent years, he’s had numerous health setbacks, only to be assisted by paramedics and other healthcare providers. On Sunday, Sayer for the first time got to thank Overhill and Kniepkamp in person, during a reunion at the ambulance station at No. 1 Road and Williams during a photoshoot for The Sentinel. Under his own power, with the help of a walker, Sayer went over and shook their hands in a reunion that was “a little emotional,” he admitted. From among Sayer’s prints, Kniepkamp chose—appropriately enough—a painting of a Harley Davidson entitled Warren’s First Ride. Overhill’s choice was a painting of a Dragonfly, colourful and full of life. Powered by the love and support of his family and friends, and buoyed by his own positivity, Sayer is set for the long road to recovery that is ahead of him.